Welcome to Royal Seaesta Vacation Homes and Condos! Emerald Coast by Owner is proud to offer you a number of properties in this area right along the Destin, FL coast on Scenic Gulf Drive! These gorgeous beachview condos come with many amenities such as convenient location, amazing view, and easy access to numerous attractions. When you stay here, you can make the most out of your trip with ease. Some of the most common things to do down here are hangout on the beach, paddle board, go to Big Kahuna’s Water Park, go to private beaches through park access, parasailing, deep sea fishing, boat tourism, and many others. Some people are looking for a relaxing trip which is no problem! You can lounge on the beach, your balcony, or go to a local spa and get a masseuse. Destin offers you so many awesome things to do, why wouldn’t you stay here Oh, and the food is amazing! There’s a wide variety of seafood spots all throughout the general area providing you with great service, food, and views of the coast to enjoy while you dine. Some examples of places like this include Dewey Destin’s Seafood and Restaurant and Pompano Joe’s, two great spots you do not want to miss a meal at. So stay at Royal Seaesta this year and make it the best trip yet! 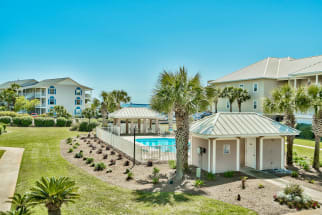 Visit us at Emerald Coast by Owner to book the best vacation rental you have ever had at Royal Seaesta along Scenic Gulf Drive Central. When you book with Emerald Coast by Owner, we make it easy for you to choose where, when, and what you want to do on your trip. Contact us with any questions and be sure to book online today!